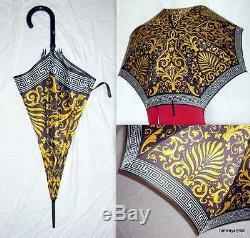 GIANNI VERSACE BAROQUE GREEK KEY PRINT UMBRELLA. RAREST VINTAGE GIANNI VERSACE 1984. NEVER USED - IN NEAR MINT CONDITION. A stunning Gianni Versace full size umbrella from Gianni Versace 1984. Using the same printers as Hermès used for their silk scarves Gianni signature details are taken to a whole new level. This umbrella has never been used - safely stored it remains in near mint condition. One of Gianni's rarest prints, this umbrella is fierce. Gianni's signature Baroque detailing combined with his signature Greek key detail produces a startling umbrella. Original 1980s silver plated name plate embossed Gianni Versace on the handle. The colors are bright, exactly as when first made. No marks on the outside of the umbrella. There is no fading of colors from where the umbrella has been folded - it is perfect. The inside wooden tube has some barely visible marks from the umbrella being opened and closed - see photos. The wooden handle has some surface marks from storage, nothing at all serious - see photos. The brown end has some barely visible marks from storage, nothing at all serious - see photos. If you prefer new to vintage the current Versace. Umbrella offering can be ordered in store at any Versace store. UYERS REMORSE IS NO EXCUSE FOR FALSE EXCUSES IN ORDER TO RETURN GOODS. Please check the measurements below. The total length is 36 inches. Width across when open is 40. Weighs approximately 18 ounces (500 grams). ANY WHITE OR OTHER MARKS IN THE PHOTOS ARE FROM MY CAMERA AND ARE NOT ON THE UMBRELLA. You absolutely will not be disappointed. PLEASE, NO QUESTIONS REGARDING AUTHENTICITY. READ THE LISTING AND CHECK MY FEEDBACK. A new gold standard of sellers the item perfection. Excellent photo just like item. AAA service & product, very professional.. I only ever sell authentic goods and describe them accurately. Txzj pxzj341 txzj-11 txzj34 txzj115. Deliveries can be tracked via U. Packages over 2 kilos in weight are sent via Encomendas Postais. Personal collection is no problem. I will help you all I can if an item is lost, but this is subject to the Postal Services rules and regulations-your claim will be against the Postal Services. ALL COMPUTER MONITORS ARE NOT THE SAME-SO COLORS VARY. If I have wrongly described something or mistakenly sent you the wrong size to that listed I will of course remedy this, but you must contact me first to arrange return. BUYERS REMORSE IS NO EXCUSE FOR FALSE EXCUSES IN ORDER TO RETURN GOODS. YOUR ITEM WILL BE THOROUGHLY CHECKED BEFORE MAILING. The item "GIANNI VERSACE BAROQUE GREEK KEY PRINT UMBRELLA-RAREST VINTAGE 1984-NEVER USED" is in sale since Sunday, January 07, 2018. This item is in the category "Clothing, Shoes & Accessories\Unisex Clothing, Shoes & Accs\Unisex Accessories\Umbrellas". The seller is "runwaystylist" and is located in Lisbon. This item can be shipped worldwide.